When fine lines turn into wrinkles, you can no longer correct them with a good night’s sleep and a simple moisturizer, it’s time to set new strategies! When you are preparing for the beginning of a filled day, have you ever wanted to turn your wrinkles instantly? Fill and soften your skin? Add brightness? With Wrinkle Power Ecollagen NovAge from Oriflame you can do it! Collagen fibers act a bit like a frame – they keep the skin dense, firm and smooth. Over the years, its natural collagen production slows down, which means the frame weakens, resulting in wrinkles. The good news is that it can potentiate your collagen levels! Many ingredients claim to potentiate collagen production, but Peptides are among the most interesting – but there are hundreds of different peptides that offer different benefits. Patented Tripeptide Technology is a combination of the excellence of three different peptides, extracted from Wheat, Rice and Yeast, which provides an excellent collagen enhancing action. Together with the collagen structure, Hyaluronic Acid molecules, which retain hydration, help keep the skin beautifully hydrated and smooth. But like collagen, its natural production reduces with age. By stimulating hydration, the wrinkles are filled and softened. Hyaluronic Acid is present in many face care products, but often as large molecules that can not be absorbed through the skin. Look for Low Molecular Weight Hyaluronic Acid – the smaller molecules are absorbed more effectively in order to penetrate the surface of the skin. Daily aggressions can damage collagen and hyaluronic acid, and cause it to deteriorate. Like a youth duardon, Edelweiss Plant Stem Cell Extract is known to protect collagen and hyaluronic acid in the skin and thus help reduce the development of wrinkles. 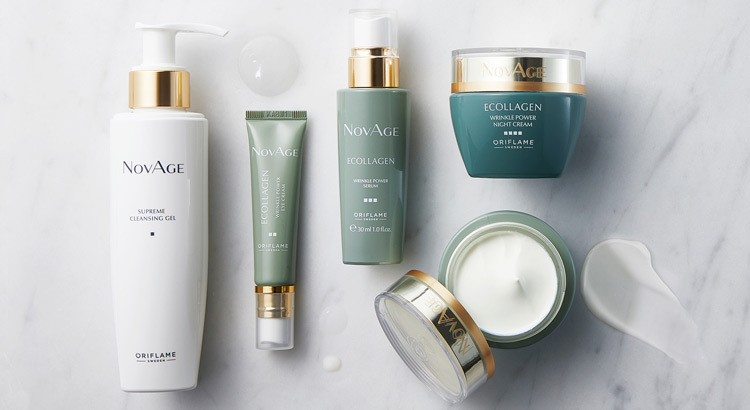 If you want to experience the effect of these ingredients, try the Wrinkle NovAge Ecollagen line – a set that contains these three actions and instantly reduces wrinkles up to 49% – clinically proven! 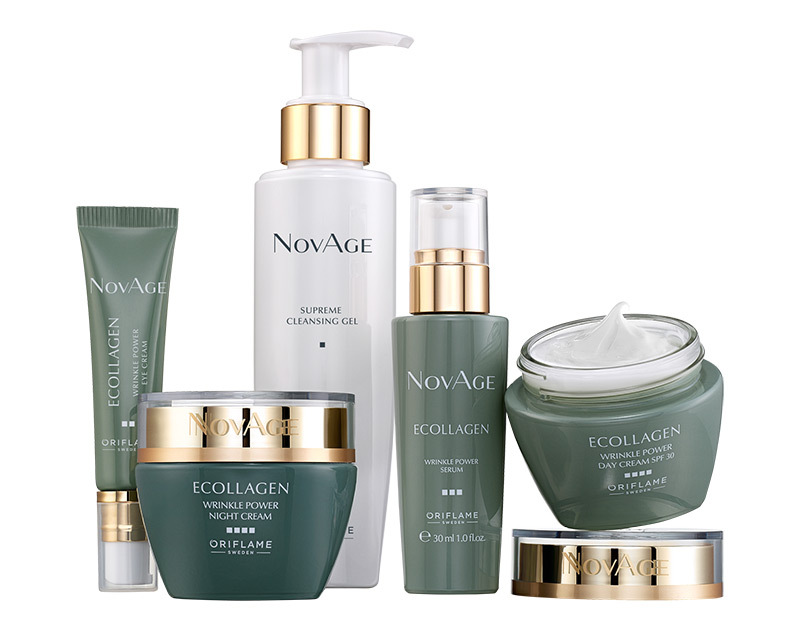 The Ecollagen NovAge Line that loves more benefits than ever before! Your Need: Look for a powerful and credible face care solution to achieve your youngest, healthier skin ever. 1. Combat specific signs of aging: The way the skin ages is completely personal and not just old. Our AgeReflect ™ scientific study verified the signs that have the greatest impact on age we seem to have as well as health. 2. Protect the skin from the aggressions that result in aging:Increasing the skin’s natural defenses can help slow down the aging process of the skin. 3. Follow a daily routine: Following a face care routine ensures that your skin is always given the best care. Wrinkle Power Ecollagen NovAge instantly reduces wrinkles up to 49% – clinically proven. It is designed to help stimulate the production of collagen, correct wrinkles with prolonged use and help slow skin aging. It can thus reveal your skin more radiant and healthy without waiting months. * Consumer test to use day cream and night cream. Before: The dark blue spot shows the deepest wrinkles, with red areas showing the highest spots of uneven skin. After: When doing the routine for 12 weeks with the serum, day cream and Ecollagen night cream, clinical results show that the length, width and depth of wrinkles are significantly corrected, and the skin proves to be smoother and refined. An intelligent formula developed to create optimal conditions for the skin to absorb the remaining products: serum and moisturizers. This cleansing removes impurities, including make-up, without harming the skin barrier, and moisturizes the skin for a toned, smooth and comfortable feel. Developed to instantly reduce the appearance of lines, wrinkles, puffiness and dark circles, and help reduce wrinkles with continued use. Supersérum with a light formula, of easy absorption, to fill instantly the wrinkles thanks to an intensely moisturizing action. Developed to stimulate collagen levels and promote healthy skin appearance with prolonged use. A powerful multi day cream, which moisturizes the skin and corrects wrinkles, leaving the complexion smooth and radiant and helping to slow skin aging. Nourishes deeply the skin for a smooth and radiant appearance when waking up. Developed to help stimulate collagen and strengthen the skin barrier with prolonged use in order to correct wrinkles to help slow down the aging process of the skin. Niacinamide (Vitamin B3) is an extremely powerful and effective skin repairer with multiple documented benefits, including promoting cellular energy and promoting a strong and balanced skin barrier. This known antioxidant plays a key role in protecting the skin from the free radicals responsible for its aging, and is also associated with skin hydration. Extracted from the fruit of the African tree of the same name, Karite butter gives an excellent moisturizing, soothing and soothing effect on the skin to make it superbly soft. * Clinically proven results using the full face vs. face care routine. skin care or a simple routine. Valid for True Perfection, Time Restore, Ecollagen and Ultimate Lift NovAge.